Purpose: With all electronic devices comes a list of things not to do to it. 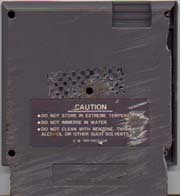 In the case of the video game, instructions on the back of each game catridge gives a list warning not to expose the game to heat, water, solvents, ect. This week, Scientific AmeriKen will take a game cartridge and give it the test to see if it can survive these horrific circumstances. Hypothesis: Warning labels are there for a reason, it is therefore the hypothesis of this experiment that any one of the conditions which may adversely affect the game cartridge will do so. Equipment: Used in this experiment was the Nintendo Entertainment System (NES), several game cartridges to use with the system, an air convection oven, rubbing alcohol, water, large dish to hold water, Air rifle and pellets, and a car. Also used in this experiment was super glue. Procedure: The first step is to test the game. Place into machine, and turn on to make sure it works. Then the first test is to shoot the cartridge with the air rifle. After each shot, test to see if cartridge still works. Next, with a new cartridge, (or old if it still works), test to make sure it works, then place in an convection. In this experiment it was placed in the oven for 1 minute at 250 degrees (F). Allow to cool and test in the nintendo to see if it works. Repeat this experiment however, place in a bowl of water instead of the oven and allow to soak. Remove it and allow to completely dry to determine if it still works. The next part is to clean the game with an alcohol solution and test. Finally, run a cartridge over with a car, reassemble if necessary and test in the nintendo. Record and analyze results. 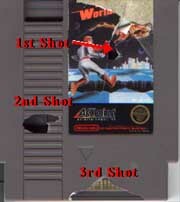 After all shots, the cartridge continued to work. No shots actually hit the computer chip inside the cartridge, however, shots 4,5 and 6 hit the cartridge but bounced off. Heated at a temperature of 250 degrees for 1 minute Cartridge continued to work. Submerged in water and then allowed to dry Cartridge continued to work. Cleaned in Rubbing Alcohol Cartridge continued to work. After Cartridge was reassembled it failed to work. Computer chip inside received minor damage. Conclusion: Based on the results, it would seem that the nintendo cartridge is in fact fairly indestructible. The same cartridge survived all the test until it got run over by a car. Although the results of this experiment proved the hypothesis wrong, the results do lend a little support to those who ignore warnings on a regular basis. The following midi was discovered at Nintendo Midi Central, it is titled, "Mario Bros. Theme"